The best way to buy and finance your next vehicle. Buy from Enterprise Car Sales. You know that your credit union is the perfect place to get pre-approved for an auto loan at one of the most competitive rates around. 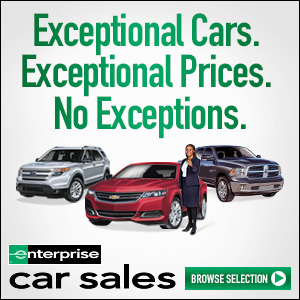 But did you know that Enterprise Car Sales is the perfect place to buy your next vehicle? Every vehicle they sell is rigorously inspected by an ASE-Certified technician and comes with a 12-month/12,000 mile limited powertrain warranty. Their professional staff is trained to work with you, helping you find the right vehicle that fits your needs and your budget. Your credit union and Enterprise Car Sales…the best way to buy and finance your next vehicle. 12-MONTH/12,000 MILE LIMITED POWERTRAIN WARRANTY. And, you’ll never have to haggle about prices.